FORT LAUDERDALE, FL--(Marketwire - February 8, 2010) - MSC Poesia sails her inaugural fall foliage Canada/New England cruises September 22 from New York City with 14 itineraries and nearly 25 ports of call for guests departing New York and Quebec. Rates begin at $599, and Kids Cruise Free. Crimson and gold landscapes dazzle during the fall in New York City. Discover the colonial history, exquisite mansions and lighthouses of the New England coast, the St. Lawrence River for the French charm of Quebec, and quaint shops in Prince Edward Island, Nova Scotia and Newfoundland. Cruises vary from 6- to 19-nights, and can be combined for an extended experience such as the repositioning cruise on October 23 with the Les Merle Big Band. -- 6-night "Maple Leaves & Mansions" cruise departing Quebec City and calling in Sydney, Nova Scotia, Canada; Boston, Massachusetts; Newport, Rhode Island; and New York. October 23. Rates begin at $599 [plus $81.40 pp. government fees and taxes (GFT's)]. -- 7-night "Scenic Splendors of Fall" cruise departing New York City and calling in Halifax, Nova Scotia, Canada; Charlottetown, Prince Edward Island, Canada; Corner Brook, Newfoundland, Canada, and Quebec City, Quebec; Canada, October 2. Rates begin at $699 (plus $78.50 pp. GFT's). 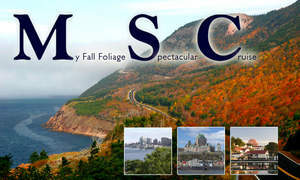 -- 7-night "Brilliant Colors of Fall" cruise departing Quebec City and calling in Sydney, Nova Scotia, Canada; Bar Harbor, Maine; Boston, Massachusetts; Newport, Rhode Island; and New York. October 9. Rates begin at $739 (plus $67.80 pp. GFT's). -- 9-night "Autumn Leaves to Palm Trees" cruise departing Quebec City and calling in Sydney, Nova Scotia, Canada; Boston, Massachusetts; Newport, Rhode Island; New York, and Fort Lauderdale. October 23. Rates begin at $849 (plus $102.40 pp. GFT's). -- 10-night "Dazzling Fall Foliage" cruise departing New York City and calling in Sydney, Nova Scotia, Canada; Charlottetown, Prince Edward Island, Canada; Quebec City, Quebec, Canada; Halifax, Nova Scotia, Canada; Newport, Rhode Island; and New York. September 22. Rates begin at $999 (plus $72.90 pp. GFT's). Kids Cruise Free (17 and younger) when sharing a stateroom with two full-fare-paying adults. Government fees and taxes are applicable. Aeroplan Members earn Aeroplan Miles on select MSC cruises offered throughout the Mediterranean, Northern Europe, Caribbean, Canada/New England, transatlantic and positioning cruises. Visit www.msccruisesusa.com/aeroplan.